Whether you want to work, live or play, s1 has all the information you need about Glasgow. Glasgow is Scotland’s biggest city, situated on the River Clyde with a distinct style of Victorian architecture dating back to the 19th century and built using the wealth from shipbuilding and international trade. Although trade on the Clyde is only a fraction of what it once was, there’s still shipbuilding taking place at the BAE Systems and Peel Group yards and there’s plenty of engineering firms in industrial estates all over the city. From this background of Engineering, Glasgow has transformed into a city of financial and hi-tech firms. Most of the big international banks have offices in the city and these have created a wealth of specialist IT firms who support them and other industries across the country. There has also been a shift in demand from sales and contact centre jobs to IT and telecoms jobs over the last two years. There has also been a shift in job vacancies from financial services & investment jobs, to accountancy. This may be due to a contraction in the investments sector and an increase in demand for bankruptcy and insolvency accountants, due to the recession. 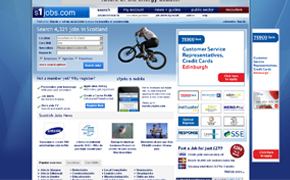 Currently there are over 900 jobs in Glasgow advertised on s1jobs. Glasgow has gone through many stages of redevelopment over the past 200 years and this has resulted a huge variety of housing styles from large Victorian villas to modern ‘social housing’ apartment blocks. The largest, most recent redevelopment of the city was during the 1960s and 1970s where huge areas of tenement buildings were demolished to make way for high-rise flats. The best example of this was in the Gorbals where tower blocks designed by Sir Basil Spence were built, and then 20 years later demolished, to make way for the New Gorbals. The last 12 months have seen a small decline in the asking price of homes for sale in Glasgow, but a small increase in the average selling price. The average asking price for the last quarter was £149,271 with the average selling price coming in at £144,450. This data shows a comparison between asking prices on s1homes and the selling price from the Registers of Scotland data. 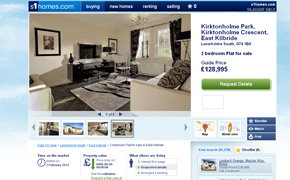 See the s1homes Scottish house price report for more details on this. Despite contraction in the housing sector, there is still a buoyant market for properties that are priced correctly. Currently, on s1homes, there are over 1,800 houses for sale in Glasgow and over 3,000 flats for sale in Glasgow. Glasgow also has a buoyant rental market with over 1,400 flats to rent. One of the reasons why there is so much demand for jobs and housing in Glasgow has to be the amount of food, drink and entertainment on offer. The list of music venues alone would be enviable for any city: Glasgow Barrowlands, King Tuts Wah Wah Hut, o2 ABC, o2 Academy Glasgow, Clyde Auditorium, the SECC and the new 12,000 seat Scottish Hydro Arena, is just scraping the surface of what the city has to offer. To see more of what the city has to offer then check out s1play.com where you can find information on over 1,200 gigs, plays exhibitions and other events across Glasgow over the next few months. To help people get between their jobs, homes and events, Glasgow has a modern and well integrated transport system. Subway: Glasgow has a 15 stop Subway system which takes just 24 minutes to do a loop of the city. The Subway connects up to both Glasgow Central and Glasgow Queen Street stations as well as bus stops across the city. Rail: Glasgow Central and Glasgow Queen Street stations have both intercity and local connections across the Scotland and the UK. Bus: The main hub for bus activity is Buchanan Street Bus Station where over 1,700 bus journeys depart from each day. Most of these serve the local and SPT area but there are connections to cities across the UK. Car: Glasgow is a very car friendly city with extensive parking in the city centre and great motorway connections from the M8, M77 and new M74 extension. Glasgow has an extensive education system with 140 primary schools and 30 secondary schools. There are also four specialist schools covering dance, Gaelic, outdoor education and sports. Glasgow also has 25 further education collages and three internationally renowned universities – Glasgow University, Strathclyde University and Glasgow Caledonian University. Renowned for being the 2nd largest shopping Centre in the UK, Glasgow is home to Style Mile (one square mile of high street shops and designer boutiques) and many out of town shopping centres including Silverburn, Braehead and The Fort.